Gladfield Malt wants to partner with you to make exciting, delicious beers and whiskies with 100% all natural ingredients. Explore our extensive and unique malt range, and let us know if you would like a sample before you start your next batch. If you can’t find what you are looking for here, let us know. We love experimenting with brewers to create new malts that deliver exciting colours and flavours. To place a malt order, or to discuss creating a custom malt, contact us today. Lightly toasted, with notes of plain white bread. Malt roasted to a light brown colour. A stronger version of our Biscuit Malt. Nutty, notes of very light roasted coffee. Amber/brown colour and light roast flavours. Porters, Brown Ales, Dark Ale, Dunkel. Lighter version of Chocolate Malt, roasted to a lower temperature and lighter in colour. Nutty, with hints of dark toasted bread. A typical roast character with minimal acridness. Hints of dark chocolate. Smooth roast flavours and deep colour. Dark malt in colour and light on astringency. Dark chocolate & medium roast coffee notes. Smooth roast flavours and deep, dark, rich colours. Saccharified malt with crystalized sugars. Toasted bread with butter and honey. Sweet granola with freshly cooked pancakes. Sweet caramel flavours and body. Dark caramel sweetness with a slight toasty, roasted character. Light brown sugar. Dark, almost burnt caramel with hints of cherry. Nutty bittersweet caramel flavour and body. Premium malt produced from 2-row barley for distilling. Flavour and good yields for single malt whisky distilling. What started out as a limited release specialty malt it proved so popular it is now a permanent part of our range. A bitterless black malt, Eclipse is the best way to add the smoothest dark brown/black colour without the accompanying bitterness only a very subtle flavour combination. Use for many styles when you want to adjust the colour whilst adding a delicious minor roast coffee note. 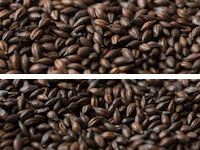 Use in place of Roasted Barley to achieve similar colours without the dark espresso character or potential astringency that can sometimes come from very dark barley malts. Huskless, Eclipse Wheat will not carry bitterness into your beer. Use 1-2% for little to no flavour combination and minor colour adjustment. 2-6% to add more colour with very smooth roasted coffee and chocolate notes. 7-10% for more definite colour adjustment and a velvety-smooth subtle roast character. Base malt modelled after popular European pilsner malts. Slight raw dough character, no malt taste and with an outstanding clean finish. What does it add to the beer? – Solid malt backbone with minimal flavour, also it is plain, simple and offers plenty of flexibility. Base malt for traditional European style beers and Belgian style beers. Harraway’s Flaked Barley is produced much like their rolled oats. Raw barley is steamed and then pressed through a pair of rollers. Flaked barley can also be added directly to the mash with base and speciality malts. Flaked barley also performs well as an adjunct in German style pilsners, as it can produce lighter colour without lowering the gravity. Similar to our Pilsner Malt with a lower colour contribution. Light colour and malty flavours. 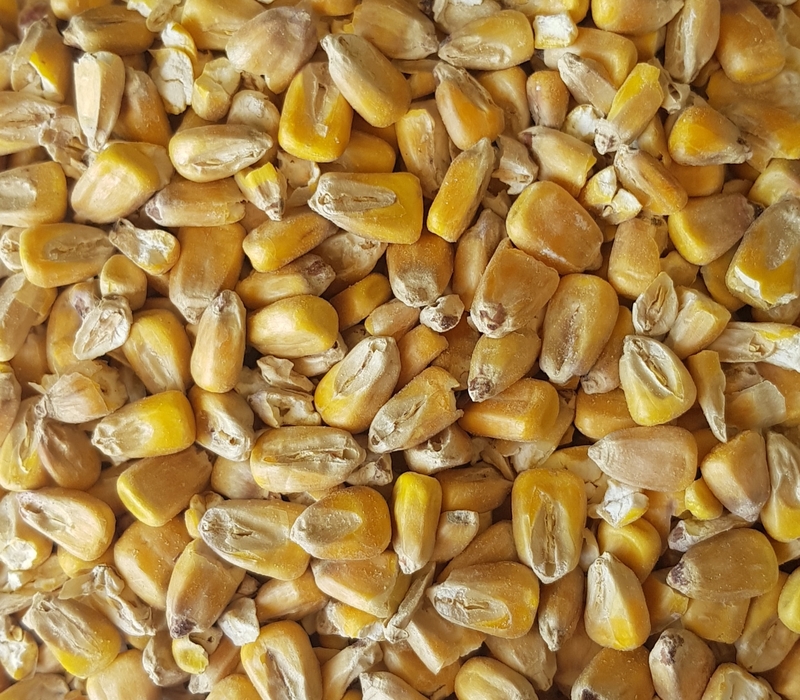 South Island of New Zealand grown premium Maize. Maize malt adds mild, less malty flavour to beers and less body. It also provides a drier and crisper beer. American Light Lager, Mexican Lagers, Pilsners. It is also suited for Bourbon Whisky making. Up to 25% in beer and 51% in distilling. You should crush Maize Malt along with other malts. No need to adjust the mill, cook it, step mash or mill it separately. We recommend adding Rice or Oat Hulls to recipes using more than 10% of Maize Malt to avoid a stuck mash. Overlaid with floral, sweet characteristic with natural Manuka smokiness. Smooth, natural smokiness to the finished beer or whiskey. Old German style beer like Rauchbier or distilling Single Malt whiskey. Distillers Malt smoked with 100% New Zealand peat. Earthy, subtle leather aromas with hints of smoke. A unique, mild peaty taste to whiskies and beers. Stouts, Dark Ales, or Single Malt Whiskey. 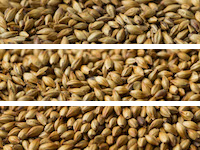 Base malt kilned to produce great body and rich malt flavours. Bready, moderate sweetness, with mild honey and biscuit flavours. A deep orange colour and a malty, nutty flavour. Oktoberfest, Dunkel, Dopplebock, Red Ale. Oat Hulls are the outer shell layer of the oat, inedible and normally removed from the oat, when used for brewing the hulls improve the filter bed of the mash to decrease the likelihood of a stuck mash. Oat hulls are non-fermentable, and provide bulk helping prevent the mash from settling and becoming stuck during the sparge. Hulls are generally used when making wheat or rye beers. Sweet hay, muesli with minimal sweetness. Light malty flavour and good diastatic power. 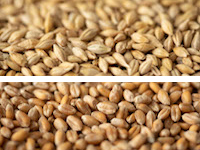 Gladfield Malt can provide malting quality raw barley and wheat on request. All our grains are sourced from farms located in Canterbury, New Zealand. 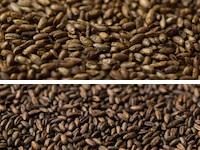 Please note that none of the grains we sell or use in our malts are genetically modified. The grain will be screened to remove any chaff and small grains and is perfect for adding something unique to a beer or a whisky. Raw grains will also bring some unfermentable carbohydrates to the brew when unmalted, giving more body to the finished beer. Lightly roasted, crystalized malt with a lovely red hue. Unique to Gladfield Malt. Caramel, candied prune, with a slight bitter orange flavour. Increase body and head retention. Well balanced toasty character, chocolate and nut notes with a dark espresso finish. Moderate roast. Balanced chocolate and coffee flavours. Harraway’s Jumbo Oats are a versatile adjunct that we offer alongside our malt range for our customers convenience. These wholegrain oats have been rolled into flakes that can then be added directly to the mash with base and speciality malts. Rolled oats are also effective for adding body to low alcohol beers. Plain, moderately nutty and slightly bready. Specialty malts for a limited time only. Contact gabi@gladfieldmalt.co.nz for more information. Richly roasted to bring a smooth espresso creaminess to your dark beers with a touch of rye spiciness. Beautiful in a porter or oatmeal stout where the coffee spice character is particularly well matched with the roast malts. Adds a further level of complexity to Vienna in a Dunkel or even something a little uncommon to a mild or English brown. Use 1-5% to enhance aroma and flavour characters without imparting bitterness or astringency. Please use the malt as fresh as possible and see our suggested recipe for a simple but surprisingly complex NZ Dunkel. Wetting the rye and carefully kilning produces a remarkably delicious and complex crystal malt with a slightly spicy caramel finish caramel and a nutty aroma. Superb in a range of beers including Pales and IPA’s, brings a new level of complexity to Golden Rye’s and is fantastic in a rye lager where a little spiciness changes things up rather nicely. Use up to 25% but as with all Ryes consider adding a few rice hulls as the ratio increases to assist lautering efficiency. Please use the malt as fresh as possible and see our suggested recipe for a delicious Golden Rye. Roasted malt with an intense deep flavour. Potent bready, raisin puree, and cola flavours with a lingering fruity sweetness. Provides lots of flavour and a lovely red hue. Use sparingly to avoid bitterness. Used to lower the mash pH by encouraging lactic acid growth during germination. Warm pizza crust with nutty, toasted caramel flavours. Toasted, caramel, nutty flavours without residual sweetness. Lightly caramelized malt, low in colour. Unique to Gladfield Malt. Cream and vanilla candy-like sweetness with notes of honey and toffee. Wonderful dessert like flavours, a chewy consistency, enhanced stability, body and mouth-feel. Up to 25%. Due to Toffee Malt’s higher moisture content, consider blending through with base malts to ensure a good crush and full release of flavour. Malty with medium toast. Moderate sweetness like toast with honey. Light malty flavours. A big, white head, lots of body and golden to orange colours. Up to 100%. Combines well with Gladiator Malt and Toffee Malt. Body and head retention, with a typical wheat flavour. Can’t see what you were looking for? Gladfield Malt would love to work with you to create a new, exciting range of malt for your next beer. Let us know your ideas to start work on a custom malt. For more information on any malts in our range, contact Gladfield Malt. Orders can be placed online 24/7.